Intertops Poker and Juicy Stakes Casino are giving you free spins on popular Betsoft slots with every deposit this weekend. The larger your deposit, the more free spins are included. All of the featured slots from Betsoft are brilliant big screen, high resolution games. One of the featured games includes Betsoft’s amazing new Ogre Empire slot. "We had to make it really worth it to work your way up to the final bonus," explained Intertops Poker's casino manager. "So we're giving a LOT of free spins on our latest and greatest slot!" In Ogre Empire, the townspeople of a fantasy kingdom have a rather inconvenient Ogre problem. An innovative Day/Night cycle switches up gameplay and allows you to experience what life is like for the people who live in the town. During the day, the Ogre is awake and active while the townsfolk sleep. Occasionally, Ogre smashes stone symbols, offering extra rewards. Once night falls, the Ogre drifts to sleep and the townsfolk emerge from their homes, bringing higher payouts with them. The Joker is Wild and doubles payouts. Both Day and Night modes also offer a special Wild flower blossom. As each flower blossoms or shoots spores, it turns other symbols on the reels Wild. 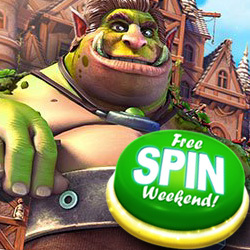 Free Spin Weekend bonus codes can be used in any order. There is no limit to the number of times you can claim each bonus.